News & Events » Environmental Law Alert Blog » Bill 15 – Important protection for agricultural land or an assault on farmers? Bill 15, the Agricultural Land Commission Amendment Act 2019, currently being debated in the BC Legislature, has revealed deep-seated divisions between the governing BC NDP and the opposition BC Liberals over the protection of agricultural lands in the province. The bill will restore some of the legal protections for the BC Agricultural Land Reserve (ALR) that were lost under the previous BC Liberal government in 2004. In response, the BC Liberals are accusing the BC NDP of “attacking BC farmers and rural communities” in an online petition. In 1973 the BC government created the Agricultural Land Reserve – a special land use zone – in order to protect agricultural land, in response to large areas of agricultural land (6,000 hectares a year) being lost to development. The Agricultural Land Commission (ALC) is appointed by the province to oversee the ALR, including adding and removing land from the reserve. The approximately 4.6 million hectares in the ALR cannot generally be used for “non-farm purposes” (with some exceptions), unless the Agricultural Land Commission approves the non-farm use or the removal of the lands from the ALR. In 2004, the BC government re-designed the ALC with a stated aim of delivering better “regional” representation on the ALC. New “regional panels” were established, with appointments from each region. The 2004 changes also allowed the ALC to delegate its powers to other government agencies, including (controversially) the Oil and Gas Commission. Evidence is mounting that the new Regional Panel system is not providing adequate guardianship for the province’s scarce agricultural land. … The four decisions analyzed in this report vividly illustrate the weakness of the Regional Panels protection of British Columbia’s agricultural land. In each of these decisions a Regional Panel allowed an exclusion or non-farm use of ALR land with questionable justification. Similarly, a 2010 review by the Auditor General of BC found that the ALC was not adequately protecting agricultural lands, for a number of reasons. Further amendments to the ALR in 2014 created two different ALR “zones,” which receive different levels of legal protection. “Zone 1”, which included ALR lands on Vancouver Island, the South Coast and the Okanagan, continued to prioritize agricultural protection. For “Zone 2”, which included ALR lands everywhere else in the province, the ALC was required to consider other factors, including socio-economic “values,” alongside agricultural preservation goals. In other words, protection of agriculture was weaker on Zone 2 lands – the majority of the ALR. In November 2018, the government passed a law eliminating the Zone 1/Zone 2 distinction, confirming that protection of agriculture remains the primary purpose of the ALR. This bill (Bill 52) also limited the size of mansions on ALR lands and set rules intended to stop contaminated soil from being used as fill on ALR lands. Now Bill 15 proposes to remove the regional panels, giving a province-wide ALC the power to determine what happens on ALR lands for the first time since the early 2000s. It replaces the regional panels with “administrative regions” and requires at least one commissioner to be appointed from each region, ensuring regional representation. Zimmermann said while he feels the regional panels have worked well in dealing with applications concerning agricultural land use across B.C., there were concerns about overall consistency, from a provincial perspective, when it came to panel decisions. He said a return to a single commission, with regional representation on it, should address that. Also, the Chair of the ALC will have increased powers to strike regional or expert panels to assess applications for inclusion, exclusion or variances in the ALR where appropriate. Another major shift in the Act would remove the ability of individual landowners to apply to exclude their land from the ALR. Instead such applications would need to come through the area’s local government or First Nation, who, the government suggests, will better integrate such requests into their planning. This option exists in the current Act – Bill 15 simply removes the option for landowners to deal with the ALC and their local government or First Nation separately. I support the Agricultural Land Reserve and efforts to protect farmland, but this Bill goes too far in eroding the fundamental rights of private property owners. The NDP may think it knows best when it comes to managing people’s private property, but that’s just plain wrong. However, this argument ignores the reality that in many cases under the current system, landowners must make two entirely separate applications to remove land from the ALR: one to the ALC, and one to the local government. So for at least some farmers, the requirement to apply for an ALR removal through a local government may actually simplify the steps for a landowner. Under the new Bill, applications to remove land from the ALR can also come from the ALC itself, in addition to applications from local governments and First Nations. It is unclear, however, when the ALC might choose to do so, and if it might choose to do so if a landowner puts forward a particularly compelling reason to amend the ALR’s boundaries. We’ve asked the Ministry for clarification, and will post an update if and when we receive it. Improve the ALC’s enforcement powers. What about oil and gas development in the ALR? Bill 21 [of 2004] expands the ability of the Commission to delegate its powers to permit non-farm use and subdivision of agricultural land. … An example is delegation to the Oil and Gas Commissioner for decisions relating to oil and gas development on agricultural land. It raises the potential problem of delegating decisions to bodies that have little interest in or a mandate at odds with the Commission’s mandate. Some have speculated that the 2014 amendments to the Agricultural Land Commission Act, creating a weaker Zone 2 in much of the province, was intended to accommodate oil and gas development in the northeast of the province. In 2014, the then Liberal government split the 40-year-old reserve in two. The dramatic change coincided with the government’s promotion of liquefied natural gas, or LNG, processing in the province. … [I]n northern Zone 2, which encompassed both grain country and gas land, the rules were relaxed making it easier to use farmlands for “other” purposes. Oil and gas development expanded dramatically across the farmland- and oil- rich Peace River region. Despite concerns, in December 2017 the Agricultural Land Commission signed a new delegation agreement reaffirming the Oil and Gas Commission’s powers to grant permission for non-farm use. The development of the energy sector has exceeded the capacity of the current regulatory environment to protect farmland. The impacts of oil and gas extraction on agricultural land and farm businesses in Northeast B.C. have reached a breaking point. Cumulative impacts over the last decade from accelerating oil and gas development have rendered portions of agricultural lands unusable and others difficult to farm. With continued changes in extraction and processing methods along with the pace and scale of development, these activities that were once considered temporary are no longer. Instead they are permanent industrial sites built on farmland and next to farm communities. Immediately form a senior executive led (Deputy Minister-level) multi-agency and multi-jurisdictional task force to develop a strategy focused on how a balance can be achieved between agriculture and oil and gas extraction. If created, the taskforce would “develop a strategy to address the significant resource extraction issues impacting the ALR and its farmers and ranchers in B.C.’s Peace River region,” and (among other things) examine whether the delegation agreement between the ALC and the Oil and Gas Commission was the appropriate approach. Bill 15 does nothing to respond to this recommendation, and we are not aware of any announcements on the task force. We’ve asked the Ministry for an update on the status of the high level committee and what is being done to address oil and gas development in the ALR, but have yet to receive a response. 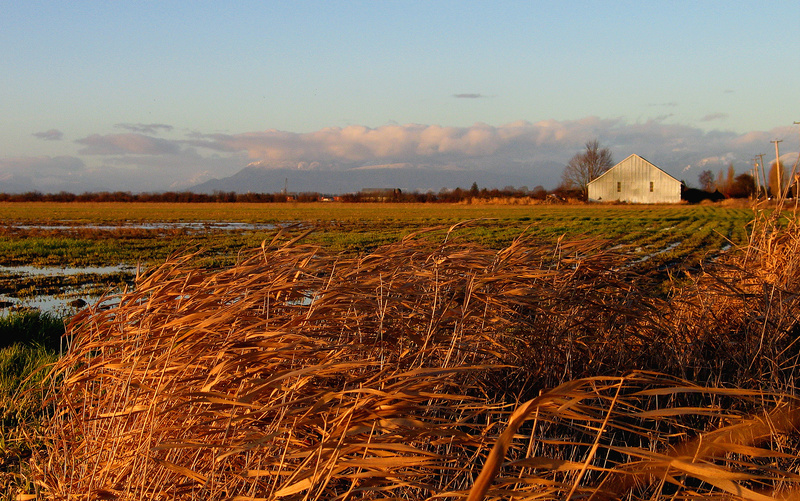 A 2014 survey found that 95% of British Columbians support the Agricultural Land Reserve, so it appears that the BC government is on the right side of public opinion with these amendments. It is less clear what the BC Liberals have to gain with their characterization of the Bill as an assault on farmers and rural communities. The complaint that farmers now have to make an exclusion request to their local government, rather than requesting one directly from the ALC, may be too technical for many voters. Let us know in the comments below: Is BC striking the right balance between protecting farmland for current and future generations and the property rights of individual farmers? What more should the province be doing? Top photo: Gord McKenna via Flickr.